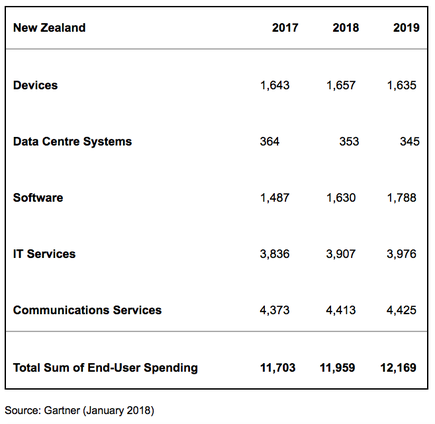 Total spending on technology products and services in New Zealand is forecast to grow 2.2 per cent in 2018, reaching almost $12 billion across the local market. Central to such growth will be communication services, accounting for $4.4 billion of expected spend during the next 12 months, spanning consumer and enterprise fixed and mobile voice and data services. Next on the list of investment priorities is IT services at $3.9 billion, which represents business IT services and product support. Delving deeper, devices will account for $1.6 billion of spending, emphasising the continued importance of PCs, tablets, mobile phones and printers. Across enterprise applications such as office suites and analytics, alongside infrastructure software such as security and virtualisation, software spending is expected to reach $1.6 billion in the year ahead. With each segment displaying growth from 2017, albeit slight, data centre systems bucks the trend with a small decline in spending, with servers, storage, network equipment and unified communications expected to represent $353 million of the market, down from $364 million. 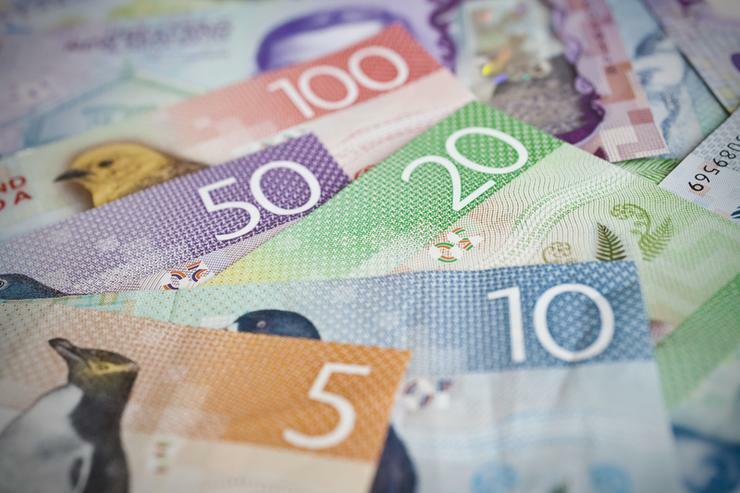 Local growth figures are slightly behind worldwide IT spending however, which is projected to total US$3.7 trillion in 2018, representing an increase of 4.5 per cent from 2017. “Global IT spending growth began to turn around in 2017, with continued growth expected over the next few years,” Gartner research vice president John-David Lovelock observed. Despite such uncertainty, Lovelock said businesses will continue to invest in IT as they anticipate revenue growth, but spending patterns will shift across the market. “Projects in digital business, blockchain, Internet of Things (IoT), and progression from big data to algorithms to machine learning to artificial intelligence (AI) will continue to be main drivers of growth,” he added. From a global technology standpoint, enterprise software continues to exhibit strong growth, with worldwide software spending projected to grow 9.5 per cent in 2018, and it will grow another 8.4 per cent in 2019 to total US$421 billion. “Organisations are expected to increase spending on enterprise application software in 2018, with more of the budgets shifting to software as a service (SaaS),” Lovelock added. According to Lovelock, the growing availability of SaaS-based solutions is encouraging new adoption and spending across many sub-categories, such as financial management systems (FMS), human capital management (HCM) and analytic applications. Furthermore, the device segment is expected to grow 5.6 per cent in 2018, after experiencing growth for the first time in two years during 2017, at an increase of 5.7 per cent. “End-user spending on mobile phones is expected to increase marginally as average selling prices continue to creep upward even as unit sales are forecast to be lower,” Lovelock added. Lovelock said PC growth is expected to be flat in 2018 even as continued Windows 10 migration is expected to drive positive growth in the business market in China, Latin America and Eastern Europe. Meanwhile, the impact of the iPhone 8 and iPhone X was minimal in 2017, as expected. However, iOS shipments are expected to grow 9.1 per cent in 2018. 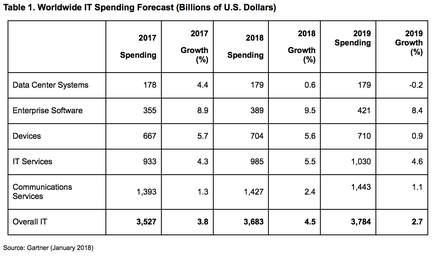 “Looking at some of the key areas driving spending over the next few years, Gartner forecasts $2.9 trillion in new business value opportunities attributable to AI by 2021, as well as the ability to recover 6.2 billion hours of worker productivity,” Lovelock added. For Lovelock, capturing the potential business value will require spending, especially when seeking the more near-term cost savings. “Spending on AI for customer experience and revenue generation will likely benefit from AI being a force multiplier — the cost to implement will be exceeded by the positive network effects and resulting increase in revenue,” Lovelock added.